Play-Doh Plus Color Set, 8-Pack – Just $4.99! 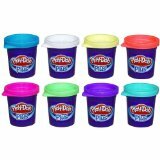 Play-Doh Plus Color Set, 8-Pack – Just $5.09! Play-Doh Plus Color Set, 8-Pack – Just $1.97!